A while back I was surprised to see that Part IV of Eva's "The Letters" series had been posted. Surprised because I wasn't aware that there had been Parts I-III. (Actually, it wasn't that surprising that I didn't know about Parts I-III because I was a relative newcomer to the world of fan fic.) 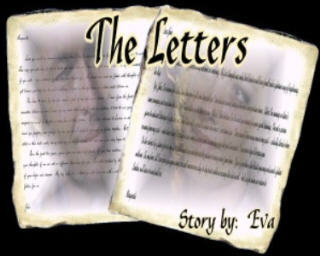 I immediately went to Carolyn's fantastic fan fic site to check out "The Letters." What I found was a beautiful series of stories centered around Marguerite and Roxton's growing relationship and letter writing. I hope to be able to bring all four parts to you here in THE READING ROOM, but for now I hope you enjoy "The Letters - Part I." "Beside the flowers was a folded letter addressed with her name "Marguerite". " Marguerite returned from her morning bath at the pond refreshed, renewed and with a sense of optimism she hadn't felt in a very long time. She had the strangest feeling that today would turn out to be a perfect day. As she entered her bedroom, her senses were greeted with a sultry aroma. During her swim, someone had placed a vase on her night table containing flowers of every shade of the rainbow. Who could have put them there she asked herself. As if she had to ask. Beside the flowers was a folded letter addressed with her name "Marguerite", obviously penned in someone's best handwriting. Marguerite curled up on her bed and opened the letter curiously as though she were opening a Pandora's box...something that would show her all the treasures of the world. As she unfolded the letter, she immediately recognized the handwriting and her lips curled into a smile. She had read enough hastily scribbled notes from Roxton informing them of his spur of the moment hunts to know his manly scrawl. This time, however, he had taken great pains to write clearly and courtly, as though to impress her with not only the words but also the style with which they had been written. "You have to know...how much a part of my life you've become." Since you insist on running away every time I try to share my feelings for you, I feel compelled to write them in a letter. This way you will have it all in black in white and as I know you put so much stock in signed documents, this can serve - if you will - as a contract of my intentions toward you.My heart and mind are filled with thoughts of you being so close and yet because you keep me at such a distance, it feels as though there is a whole world between us. You have to know by now how much a part of my life you've become. I knew from the first night we met there was a connection between us and I made up my mind that night I would do whatever it took to win your affections. But I never imagined we would be trapped so long here on this plateau. If we had returned to London on schedule, I would have wined and dined you properly and perhaps by now you and I would be planning our future together. But here we are still on this plateau, still in this lost world, living each day as though it were our last and we've only begun to scratch the surface of our relationship. Over the past two years, you've given me only brief flashes of your true emotions Marguerite, yet I feel strongly that your thoughts of me are not so different than mine for you. I'm still troubled by the night you suggested I may not be part of your hopes and dreams. My only wish now is that you will honor me with a return letter giving me the hope that you see a future for us. John returned to the treehouse exhausted from his morning chores, and went straight to his room to freshen up for lunch. He was hoping all morning his letter had been read and savored, and that a reply would be waiting either in the form of a letter, or of the lovely lady herself. As he entered his room and pulled his sweaty shirt over his head, his eyes were drawn to the neatly folded letter lying on his pillow with the delicate handwriting that was unmistakably Marguerite's. A smile rushed over his freshly sunburned face as he realized she had taken great pains to write his name "John" in her best script. As he settled in the chair beside his bed, he opened the letter quickly and began to read. "...my past still haunts me even here on the plateau..."
What a surprise to find the lovely flowers in my bedroom this morning. My first thought was, only Lord Roxton could have found such a glorious way of brightening day. Yes, John, I've known for a long time how you've felt about me and yes, I am always running away at the most inopportune times. Either I'm running or there's some annoying interruption like the night I was bitten by the tree scorpion. Which, I don't believe I've thanked you enough for your quick thinking. I'm not a person given to outward displays of affection, but I don't believe it's a secret to anyone how I much I care about you. There haven't been many men in my past - actually there've been no men from my past - who have risked their life to save mine as many times as you have over the past two years. I can never begin to repay you. On the subject of a future for us, my past still haunts me even here on the plateau so many miles from home. I fear if you knew the details you may not want a future with me. So, my love, all I can dare give you is my care and concern on a day-to-day basis while we occupy this lost world. And, as for when we return to London, we'll have to wait and see. Roxton and Marguerite were both unusually quiet during lunch, hardly a word to anyone, but most especially not to each other. As Roxton passed the bread tray to Marguerite, their hands accidentally touched causing John to drop the plate. Both their faces reddened. "What's wrong with you two," Veronica asked, "you've hardly touched your food." "And, you both seem nervous about something," Malone added. They began to answer at the same time... "Oh, it's nothing..."
"After you Marguerite," Roxton, sitting at the head of the table bowed deeply to the raven-haired lady sitting to the right of him. "Why, thank you Lord Roxton," she replied formally and eloquently. Everyone at the table knew something was afoot. These two were never this nice to each other unless one was playing the other one for something they wanted. What the others had not seen just before the hand touching incident, was Roxton passing a letter under the table into Marguerite's lap. She had just tucked it away in the pocket of her skirt moments before Roxton clumsily dropped the bread tray. After lunch, Marguerite quickly excused herself to her room claiming she was suddenly tired and thought she would take a short nap before completing her daily chores. "...the greeting brought a sudden smile to her face..."
When she had settled herself on top of her bed, she opened the letter Roxton had secretly dropped in her lap, and the greeting brought a sudden smile to her face. I'm very pleased the flowers were so well received. When I see such beauty growing in the jungle, I'm always reminded that an even greater beauty graces my day-to-day existence on the plateau. As to thanking me for extracting the venom that night, I assure you the pleasure was all mine. Even though you worded your response carefully about a future for us, I still sense your feelings for me go much deeper than you want to admit. I may have given the impression that patience is not one my virtues, but when the reward is spending a lifetime with someone as splendid as a Marguerite Krux, my patience can be infinite. I only ask that you keep an open mind.About your past, my dearest, how do I make you see whatever you were or whatever you did before you met me was another life. It has nothing to do with either of our lives now. My life began again the night I met you. Can you ever reach a place where you can say the same about me? Oh, Roxton...Marguerite thought...how can I make you understand? How can I find the words to make you understand? Veronica was preparing the evening meal when Marguerite entered the kitchen area just as Roxton and Malone were returning from an afternoon spent at the pond. Roxton had tried unsuccessfully all day to disburse the pent up anxiety of waiting for an answer from his latest missive. His heart began pounding at the sight of Marguerite standing there, as though she was waiting just for his arrival. He ached to wrap his arms around her and kiss her, but he feared to do so would upset the delicate balance that had begun so early that morning. Marguerite's face softened at the sight of him, and he knew at once there would be another letter waiting in his bedroom...another letter from the woman who had become so important to his daily existence on the plateau. "Dinner smells good, Veronica. I'll change clothes and then I'll help set the table." Veronica looked bewildered at Roxton's offer to assist with the meal, but even more so when Marguerite responded with "Oh, that's all right John. Take your time, I'll help Veronica. We'll call you when dinner's on the table." Veronica gave Malone a puzzled look and then turned to Marguerite. "Are you sure you feel all right? You stayed in your bedroom all day. I thought maybe you were feeling ill, or something." Challenger entered the room and upon hearing Veronica inquire about Marguerite's well being said with concern, "What? You're not feeling good, Marguerite? Here, let me feel your pulse." He deftly took her right wrist in his hand as she tried to pull away. "Really, Challenger I've never felt better in my life." "Why, my dear your pulse is racing! What happened today to get you this excited?" "I assure you, I'm all right. Now, don't fuss over me anymore, Challenger. I probably got overly excited about a dream I had this afternoon." "And, what dream would that be, Marguerite", Veronica said teasingly, "the one about you and Roxton?" Marguerite shot her a guilty...no...an embarrassed look and replied, "Noooo. I dreamed we were back home, back home in London." "Well, that would be enough to make my pulse race faster," offered Malone. 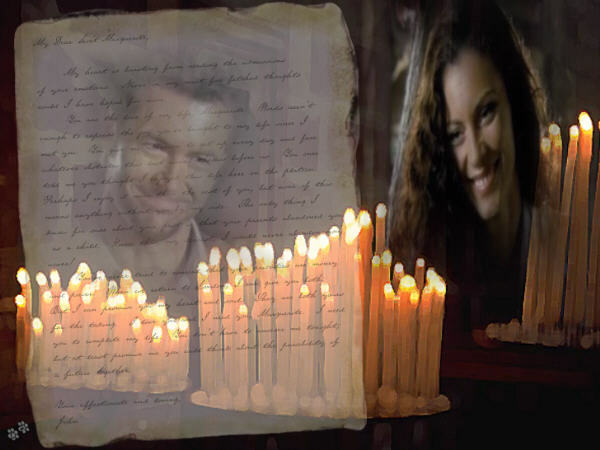 "...he opened it eagerly...his heart jumped as he read the greeting..."
Roxton held the letter from Marguerite close to his face and breathed in the delicate aroma of perfume his love had infused on the paper before he opened it eagerly to read the latest words from his love. His heart jumped as he read the greeting. Someday I hope to trust you enough to share with you my past. But as for now, while we're living under these close conditions, I can only promise to share this life with you as though no other life existed before this one. You've given me a glimpse into your heart today, of your feelings for me and I want to return your gesture with one of my own. The very sight of you makes my heart beat faster and breathing somehow becomes more difficult when you're standing next to me. When you're on one of your excursions without me, I can't describe the exquisite pain I feel when you spend even one night away from the treehouse. Perhaps I've said too much, but I've hidden these feelings for so long, it is a relief to finally say them. When Challenger called down to Roxton's bedroom that dinner was ready, John was almost embarrassed to join the others. He was afraid his love for Marguerite was written all over his face. He couldn't stop smiling. When he finally sat down next to the lovely Miss Krux, he couldn't resist touching her hair lightly and commenting on how lovely she looked tonight. "May I say, you're looking exceptionally lovely tonight, my dear." Taken aback from Roxton's bold display of affection in front of the others, she lowered her eyes briefly and blushed, then returned the compliment. "Why thank you, John. You should show your charming side more often. It becomes you." Veronica, Malone, and Challenger exchanged amused looks as it was obvious the relationship between these two was at last evolving before their eyes. They both had been in the best of moods today, something very unusual for Marguerite and even more unusual for Roxton's mood to match hers at the same time. Half way through dinner, John slipped a folded letter from his pants pocket directly into Marguerite's hand under the table. Veronica, sitting next to Marguerite, witnessed the exchange and chuckled to herself while nodding her head knowingly. "What?! ", asked Malone. "What's going on Veronica, you've been smirking all through dinner." "Oh, nothing...nothing that concerns you." Veronica looked over at Marguerite who was silently mouthing "thank you" to the young blonde woman who had become almost like a sister to Miss Krux over their time spent together in the treenhouse. Marguerite thought dinner would never end. As soon as she had taken the last bite from her plate, she immediately excused herself, almost turning her chair over in her haste to return to her bedroom. "Marguerite clutched the letter to her heart....he loves me..."
Dusk was falling over the jungle and before she settled down to read the latest message from her love, Marguerite lit several candles casting a warm romantic glow over the room. My heart is bursting from reading the admissions of your emotions. Never in my most far fetched thoughts could I have hoped for more. You are the love of my life, Marguerite. Words aren't enough to express the joy you've brought to my life since I met you. You give me a reason to get up every day and face whatever obstacles this lost world throws before us. You once told me you thought I enjoyed this life here on the plateau. Perhaps I enjoy it more than the rest of you, but none of this means anything without you by my side.The only thing I know for sure about your past is that your parents abandoned you as a child. Know this, my dearest, I would never abandon you, never! You've never tried to conceal that your priorities are money and power. When we return to London, I can give you both. But I can also give you so much more. I can promise you my heart and soul, they are both yours for the taking.I love you and I need you Marguerite, I need you to complete my life. You don't have to answer me tonight, but at least promise me you will think about the possibility of a future together. Marguerite clutched the letter to her heart as she gazed out the window at the moon that was rising slowly over the horizon of the jungle. He loves me, she thought. Maybe it is time to put the past to rest. Marguerite knew no other man had ever filled her heart so completely as Lord John Roxton. How could she say no to this man with whom she had shared so many life and death adventures. She knew no one could or would ever harm her with John as her guardian and protector. She sat down to write a reply to John's latest declaration of love. I've heard the words "I Love You" before, but never have they meant so much as hearing them from you. "Marguerite..." Roxton was knocking at the entrance to her bedroom. "John! But I haven't finished my letter..."
"Marguerite, don't you think we're beyond needing letters? All we need now is each other." He placed both hands on her arms and lifted her up from her chair, pulling her close to him. As he drew her face close to his, Marguerite whispered, "I really do love you, John." John met Marguerite's parting lips with the all the pent up emotions he had held in all day, and as they kissed he knew she was just where she belonged, in his arms. And with all the hopes and dreams contained in their letters that day, John was convinced that a future with Marguerite would be more and more of a certainty with each passing day. "...as they kissed he knew she was just where she belonged, in his arms."